I'm one of those people, as if you couldn't guess, who likes to go to shops, art fairs and whatnot and scout out new ideas. I'll see something I like and think, "how can I do that myself." The only problem with this mind set is that before you know it, I have about 50 projects on my to-do list. Gather your supplies - I went to the thrift shop and bought all 4 trays for $10. They're completely tarnished, so I gave them a quick polish using toothpaste. Yes, toothpaste. Just smear it on (or give the kids that job) and then wipe it off with a rag - the tarnish comes right off. Oh, and you'll notice I forgot to take a picture of my chalkboard paint... of course you'll need that (or instructions for mixing your own are at the bottom of this post). 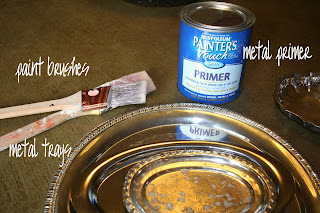 You need to use metal primer (the best place to get this really cheap is the hardware store). Just take your time painting it on. I think it helps to use a nice angled trim brush. My favorite is the Purdy brand paint brushes from the hardware store. I use them for everything! Make sure to wait a good couple of hours before painting your chalkboard paint. Again, use an angled brush and take your time. If you mess up, just use a paper towel to clean up any stray paint on the tray. Let the chalkboard paint dry for 24 hours. Then just rub the side of a piece of chalk all over the paint and wipe it off - that's an important step. Voila - finished. So easy, but there are so many ways you could really use this. My friend Erin just posted a picture today of one of these chalkboard trays that someone hung on the wall! It looks so cute hung! **Want to make chalkboard paint in your own custom colors? With a paint stirrer, mix 1 cup latex paint with 2 tablespoons unsanded tile grout. Make sure to get stir out any clumps. Apply to the tray (or whatever) using a brush. If needed you can smooth out the texture with 150 grit sandpaper. Condition the paint with the side of a piece of chalk. You may remember that I painted my kids doors with custom chalkboard paint colors - so much more fun that flat black!